Woodlands Caravan & Camping Park01970 890233work Touring & Camping ParkSituated in Devils Bridge, a small village nestling at the top of the Rheidol Valley, 12 miles inland from the coastal town of Aberystwyth, Woodlands Caravan Park is an ideal base for touring Mid Wales, walking, cycling, mountain biking, birdwatching, fishing or just relaxing and taking in the fresh air. A friendly campsite and caravan park with mountain views. Award winning toilet and shower facilities. The park is just a five minute walk to the waterfalls and village pub and takes about ten minutes to walk to the Vale of Rheidol steam train. A deposit of one nights stay will be taken to secure your booking. The balance will be due on your arrival. We may contact you to verify your card details. Open March-Oct. Last arrival 21.30. Last departure noon. Booking advisable school hols. 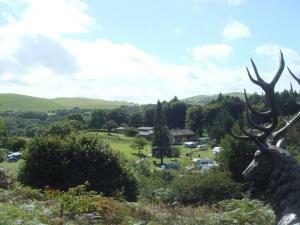 Situated in Devils Bridge, a small village nestling at the top of the Rheidol Valley, 12 miles inland from the coastal town of Aberystwyth, Woodlands Caravan Park is an ideal base for touring Mid Wales, walking, cycling, mountain biking, birdwatching, fishing or just relaxing and taking in the fresh air. Brand New Toilet and Shower facilities. New disabled fully equipped room. New Family room including shower, toilet, baby changer and baby bath. Disabled room and family room available on request. Children welcome from any age.